What is it about certain movies that you feel the need to watch them repeatedly? Either because they really stuck with you and you can't explain why and other people don't get it, or there's something about the film that has a special resonance with you and you just have to keep getting some. Here are my Top 5 films that I can't honestly explain well enough to convince anyone else to like them as much as I do. Now, many of them aren't bad films (some might be) but they're definitely not widely revered, mostly just by me. 5. Stuck on You - This is easily the worst movie on this list, but it didn't stop me from purchasing it because it hadn't been on TV recently enough so I could watch it again. 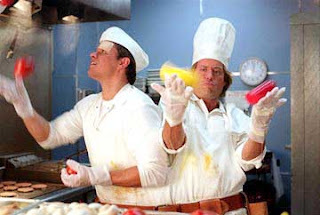 Greg Kinnear and Matt Damon are conjoined twins. They're adults and live and work on the East Coast, running a diner, and acting in local theater - or at least Kinnear is an actor. Damon gets dressed in black and stashed behind scenery when possible. They go to LA to try to make Kinnear's big break, which he gets on a TV show with Cher. Damon's pen pal also lives in LA and she finally meets them. I think the thing I like about this film is their complete acceptance that it's possible to be literally attached to someone and yet have a separate life. They sustain the concept the entire time - it's completely improbable. I love it. 4. Date Night - This movie mostly comes down to the comedic gags - jumping in the boat on Central Park and having it go 2mph, wearing their clothes backwards to look cooler, the two cars getting stuck together, Mark Walhberg not wearing a shirt, Tina Fey counting to 3. There is just enough context to all of these events that bring the film together, but it's still not an amazing movie, but I watch it over and over again. 3. Yes Man - Jim Carrey probably does his best transformation in this movie than in almost any - since it's super contrived, I'm not surprised. Carrey makes a pledge at a self-help seminar to say Yes to everything that's offered. Sometimes this is taken as needing to tell the truth all the time (even when people didn't ask you anything - The Invention of Lying), but thankfully, Carrey mostly just chooses to use it to say yes to lots of opportunities and they end up changing his life (and the people he gives small loans to). It really shouldn't work as a movie, but I still love it. 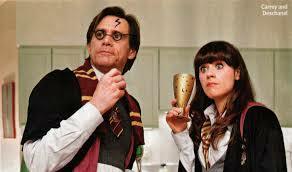 Bradley Cooper and Zooey Deschanel make the funny things he does sweeter. 2. Larry Crowne - I sense the reason I like this one is because I wanted to see myself as Julia Roberts because I too had just started teaching at a community college just after seeing this movie. Tom Hanks is Larry Crowne, a veteran who is fired from his job as a working at a big box store and has to go back to school to get a degree. He joins a scooter gang, takes Roberts' class on communication, and is crazy cute figuring out how to be a totally different version of himself than he expected. When Roberts finally can't stand her husband and gets out of the car and watches him get arrested for drunk driving while Hanks gives her a ride home on his scooter, I giggle with her. 1. 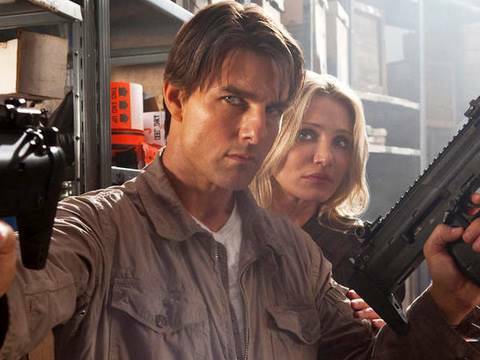 Knight and Day - This one I probably have the most trouble either justifying or defending. I neither love Tom Cruise nor Cameron Diaz, nor do I hate them. But I must say I love the odd screw-ball comedy they pull on in this one. It's their banter through the silly, over-the-top action sequences that makes me smile like an idiot at the screen. Diaz is accidentally on a plane that was meant to be an attempt to kill CIA rogue agent Cruise. He kills everyone on the plane, lands it safely, and makes out with Diaz (see, over the top). After that, he knows that Diaz will be in danger so he goes back to find her and keep her out of trouble. They end up kidnapped, on the run, etc. It's ridiculous, but I really, really want to go watch it again right now. A sad little fact is that combined I've watched these movies a total of more than 50 times. What do you watch that you can't explain or defend, but can't stop watching? I really love Yes Man and Knight and Day. My tastes can be all over the place, so I don't know if that brings you any kind of validation though. I also remember seeing "Stuck on You" awhile ago (because it was on TV) and loving it. It is so completely absurd that it comes around to being so good. Definitely an underrated movie. David - yeah, my tastes run all over too. Does make me feel better about Knight and Day too. Shala - thanks for explaining it well - it's so absurd that it does reach back to being awesome. Tarantino put Knight and Day at number 12 in his top 20 list of 2010.